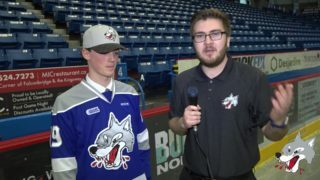 The Sudbury Wolves faced-off against the defending OHL Champions, the Hamilton Bulldogs in game three of their four game home-stand Friday night at the Sudbury Arena. 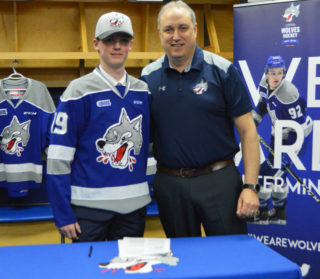 The Wolves kicked off their double header weekend with a 7-5 win with goals from Quinton Byfield, Macauley Carson, Blake Murray, Kirill Nizhnikov, and Owen Robinson. The Bulldogs came out strong with Isaac Nurse scoring six seconds into the game. The Wolves took a slower start but once Byfield notched in his fourth goal of the season tying the game at 1, they could not be stopped. Following suit, Carson recorded his first of the season with Murray, Robinson and Nizhnikov all scoring shortly after putting the Wolves up 5-1 to end the period. In the second, the Bulldogs were able to change their pace, putting more pressure on McGrath with shots on net 28-23. 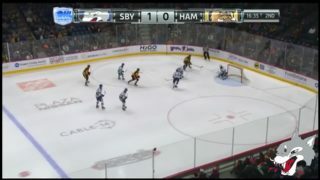 The Bulldogs made a quick comeback with goals from Saigeon, Kaliyev, and Strome. McGrath stood strong in the crease and kept the pack one goal ahead ending the period 5-4. With the final period of the game, the Wolves came out flying. Owen Robinson scored his first goal of the season with 12 seconds in, to put the Wolves up by two. Up until the last few minutes of the game the score was locked at 6-4. 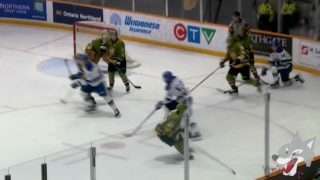 Neither team was about to give up as Mackenzie Entwistle snapped one into the back of the net past McGrath to bring the Bulldogs within one. In an effort to tie it up, the Bulldogs pulled Roy from net with less than two minutes to play. 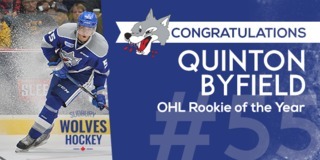 As the game wound down, Quinton Byfield managed to push the puck past the Bulldogs defensive line, scoring his second of the game and insuring the Wolves clinched the win. The Wolves return to action tomorrow night, Saturday, October 20th, 2018 at the Sudbury Community Arena where they will host the Kingston Frontenacs at 7:05pm to wrap up the double header weekend. Great seats are still available at greatersudbury.ca/ticket. New this season, online tickets purchased from your home computer or mobile device are now the same price as Box Office. 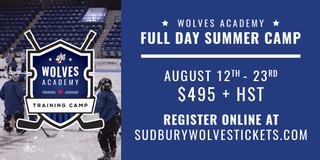 Skip the line, get your tickets early, online, scan your phone or print your tickets at home and come cheer on your Sudbury Wolves this season! The Arena Box Office will open at 4:00pm on Saturday.